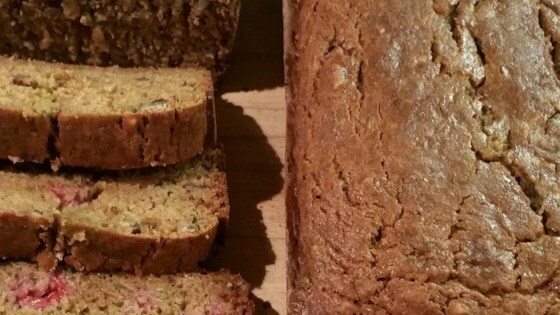 "In an effort to eat healthier, I came up with this recipe for a much healthier zucchini bread, and I was pleasantly surprised that something that is good for you tastes so good. I have raspberry plants and a garden with zucchini so these are plentiful at this time of year. I also have an apple tree where I cook the apples down with no sugar added and then jar them for later use." Preheat oven to 325 degrees F (165 degrees C). Grease 2 loaf plans with coconut oil and sprinkle with gluten-free flour. Beat eggs in a large bowl; stir in coconut sugar, coconut oil, applesauce, cane sugar, vanilla extract, baking soda, baking powder, Ceylon cinnamon, and Himalayan salt. Mix in gluten-free flour and chickpea flour, 1 cup at a time; stir until mixed well. Fold in zucchini, pecans, and raspberries. Pour batter into the prepared loaf pans. Bake in preheated oven until a toothpick inserted into the center comes out clean, about 1 1/4 hours. Walnuts can be substituted for the pecans, if desired. If you prefer a little bit sweeter bread then you can use a total of 2 cups of sugar instead of 1 and 1/2 but this was plenty sweet enough for me. I try to use as many organic ingredients as possible.